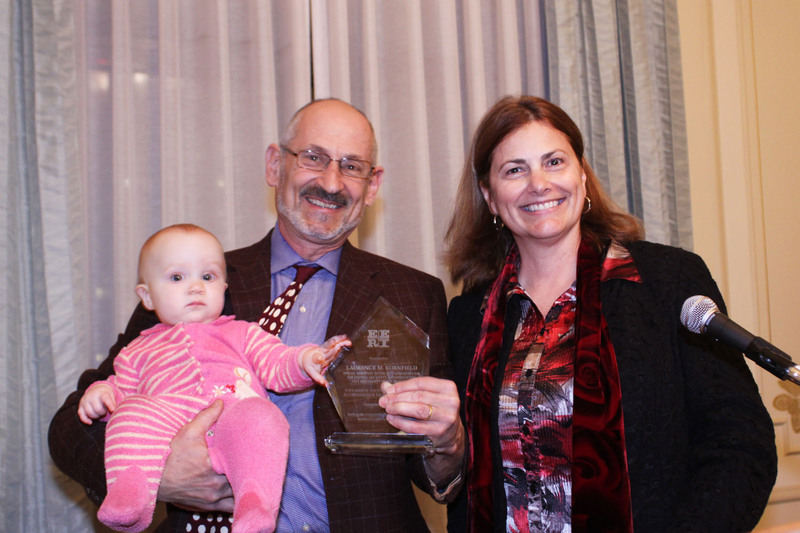 This year’s Chapter Awards for “Leadership, Innovation, and Outstanding Accomplishments in Earthquake Risk Reduction” went to Laurence Kornfield and the East Bay Municipal Utilities District. Laurence Kornfield has been a champion for seismic safety in the public administration of San Francisco for many years. 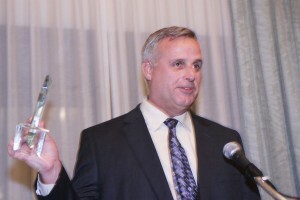 As chief building official, he helped conceive of the Community Action Plan for Seismic Safety (CAPSS) and was instrumental in finding support and funding for the program. He worked for over a decade to make CAPSS a reality, helping the program overcome a temporary suspension, and bringing it to successful closure in December of 2010. He made sure a wide range of voices in the city contributed to CAPSS by creating a diverse panel of stakeholders that was actively involved in every step of the program. The recommendations from CAPSS provide a roadmap for how San Francisco should reduce earthquake risk, protect the city’s way-of-life, and become a more resilient community. Laurence is passionate about making earthquake risk reduction more accessible to regular people. Through CAPSS and other efforts, he has worked on innovative, simple, and affordable retrofit techniques. One example is his work to develop a system to brace garage doors to improve the house-over-garage buildings so prevalent in San Francisco. He also continually encourages companies and engineers to develop standardized and affordable retrofit methods. He made sure that CAPSS focused on the social, economic, and cultural consequences of future earthquakes in San Francisco, aspects that are meaningful and influential to city residents and policymakers but are often overlooked by engineers. Laurence’s leadership has provided the City and County of San Francisco with a roadmap to a more resilient city and significant political will to work towards this goal. CAPSS is already serving as a model for communities around the world, and hopefully successful implementation of its recommendations will soon follow. Since 1994, the East Bay Municipal Utility District (EBMUD) has been working diligently to reduce the risk of damage to the water system following a catastrophic seismic event, improving fire-fighting capabilities, and protecting customers from long, disruptive outages. To cost effectively upgrade their facilities, EBMUD has used the latest advances in seismic strengthening, adopting new technologies where possible. To date EBMUD has spent over $200 million on its Seismic Improvement Program. To maintain public support for the Seismic Improvement Program, the District educates the public about seismic risks in the Bay Area through an extensive community outreach program. This program has also been used to develop a single message on how to store emergency water supplies, and has been successful through partnerships with other agencies and state and local Offices of Emergency Services. EBMUD’s leadership and outstanding improvements will assure that many of their 1.2 million customers will have access to clean water even after a large earthquake. The annual Award for “Leadership, Innovation, and Outstanding Accomplishments in Earthquake Risk Reduction” acknowledge successful risk reduction efforts outside of the Chapter. Each year the Chapter gives two awards, to an individual and an institution, in recognition of their hard work and dedication towards the reduction of seismic risk in Northern California. The recipients represent best practice examples of putting the science and engineering of earthquakes to work and demonstrate valuable contributions to the various disciplines and pursuits represented in the Chapter. The Chapter presented its first awards in 2003. Recent recipients include BART’s Earthquake Safety Program (2010), SPUR’s Resilient City initiative (2009), City of Alameda building official Greg McFann (2010), and City of Oakland Mayor Jean Quan (2009).